The Democratic Unionist Party has said there are “still issues to be discussed” with the government as Theresa May continues to try to win support for her Brexit deal. 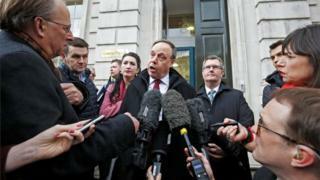 The DUP, which has twice voted against the agreement, said it remained in discussions with the government. It has been reported by the Spectator magazine that there is a “better than 50:50 chance” the party will support the deal next week. A DUP spokesman denied reports that extra money for Northern Ireland had been part of the talks, despite the involvement of Chancellor Philip Hammond in discussions on Friday. The party has previously voted against the deal over concerns around the Northern Ireland backstop – an insurance policy to maintain an open border in Ireland. The 10 votes provided by the DUP, which props up the government, are thought to be key to the prime minister securing her deal. A DUP party spokesman said: “We are in discussions with the government to ensure Northern Ireland is not separated out from the rest of the United Kingdom as we leave the European Union. Contrary to some reports, we are not discussing cash. If the deal fails to gain support, having already been defeated in the Commons by large margins twice, Mrs May has warned a longer extension may be needed, and the UK may have to take part in European elections. Latvian foreign minister Edgars Rinkevics suggested a delay of up to two years could be required if MPs continue to reject Mrs May’s withdrawal agreement. “Number one priority would be the deal that is reached is passed,” he told BBC Radio 4’s Today programme. “If it is not the case, what we need is clear vision from the UK government how much time UK needs to come up with new proposals, new ideas how we proceed. Meanwhile, the shadow chancellor John McDonnell said “quite a number” of MPs would be prepared to support a compromise deal, with the guarantee the deal goes back to the people for a final say on Brexit. Speaking before an event in Gravesend, Kent, Mr McDonnell said politicians would move “heaven and earth” to prevent the UK from leaving the EU without a deal. But any final say should not be on the deal Mrs May has agreed, “because it’s not credible”, he said. Earlier, Tory MP Nick Boles resigned from his local Conservative association after clashing with the group over Brexit. Mr Boles, who has spoken out against leaving the EU with no deal, said a “division had opened up” between him and the local association. Local activists had wanted to deselect him as their candidate in the next general election because of his stance on Brexit. Chief Whip Julian Smith said Mr Boles was a “valued member of the Conservative parliamentary party, which I hope will continue to benefit from his ideas and drive”. Separately, pro-Brexit marchers, led by former UKIP leader Nigel Farage, have begun a two-week journey from Sunderland to London. Mr Farage aims to walk 100 miles of the 270-mile March to Leave, which is due to arrive in the capital on 29 March.